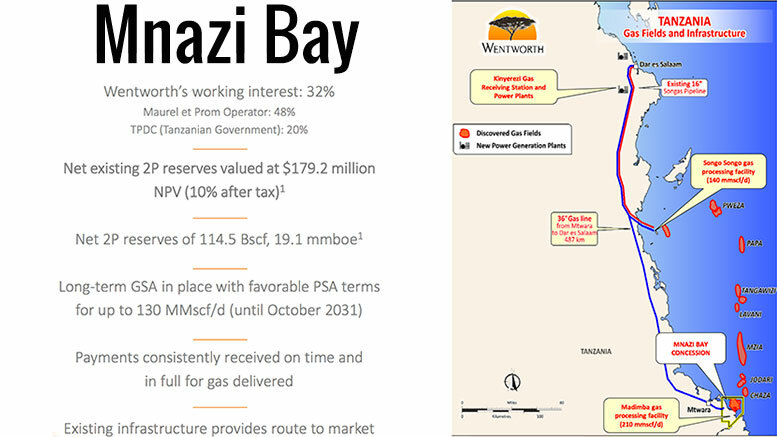 Independent East Africa-focused oil & gas company Wentworth Resources (OSE:WR; AIM:WRL) announced the results of an independent evaluation of the gas reserves within the Mnazi Bay Concession in Tanzania. According to the evaluation, in the first full year of production, all wells have produced as expected, underpinning the quality of the company’s assets in Tanzania. With Mnazi Bay gas production from the existing gas wells stabilising and the expected significant ramp up in volumes starting in 2018 in line with the expected start-up of the new power plants, Kinyerezi I expansion and Kinyerezi II, the existing reserves provide a solid foundation to grow production from the Mnazi Bay concession in the near future. Wentworth holds 31.94% ownership in the Mnazi Bay concession. The field achieved average gross daily gas production during Q4 2016 of 39.4 MMscf/d compared to 34.3 MMscf/d during Q3 2016 as less downtime was experienced at the gas fired power generation facilities, Ubungo-II and Kinyerezi-I power stations.